The process involved in generating, purchasing or selling solar power can be quite complex. Many times, legal counsel can be helpful in understanding a broad range of issues and can help guide their client through the project to maximize opportunities and to avoid potential pitfalls. 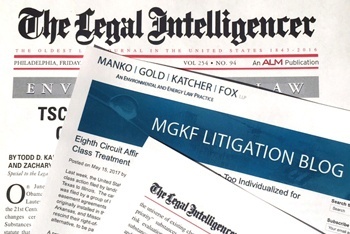 Attorneys with the environmental and energy law firm of Manko Gold Katcher & Fox shared 10 fundamental topics that may need to be addressed in the course of a solar project in an article that originally appeared in “The Legal Intelligencer” (June 2011, Volume 243, No. 113. MGKF's Brett Slensky updated the original article written by partner Brenda H. Gotanda, Esq. Read the complete article here.